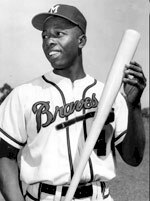 The ejection of Orlando Hernandez from Saturday’s game was a reminder of one more reason that Hank Aaron should always be remembered as the true all-time homerun king of North America, rather than the future convict currently strutting around San Francisco. El Duque was tossed, without warning, because the home plate umpire felt that Hernandez had purposely thrown at the batter. That judgment was ludicrous, but is not what will be argued here. Rather, the root problem is that fact that the umpire had the authority to make such a judgment, and thereby change the course of the game from that point forward. No longer would it be a Major League Baseball Game; rather, it would be a modified version of The Real Thing. Once an umpire ejects a pitcher for throwing at a batter (or issues a warning), both teams are warned and the next pitch deemed too far inside could result in another ejection of both the pitcher and his manager. 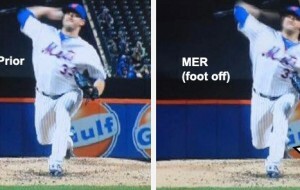 As a result, pitchers who fear ejection will be sure to steer their pitches away from the inside part of the plate — and batters have the comfort of knowing that most pitches for the rest of the game will be middle-out. In other words, it’s tee-off time. This idea of a “warning” was instituted about 10-15 years ago with the intention of curtailing bench-clearing brawls — also called “rhubarbs” in baseball lore. The game had become too violent, the Commissioner’s Office told us, and the fighting had to stop. Thereby the All-Powerful Bud Selig set forth the edict that an umpire could remove a pitcher from a game if he judged that pitcher to be intentionally throwing at a batter. In truth, the ban on beanballs has absolutely nothing to do with stopping brawls and everything to do with artificially enhancing the the more saleable, offensive part of the game. Since 1969, Baseball has been injecting hitters with rules that have as much impact on batting averages and homeruns as steroid needles. First, they lowered the mound from 15 to 10 inches. Then, the American League employed the Designated Hitter on an “experimental basis”. These two rules leveled the playing field between batters and pitchers — even sabermetrics pioneer Bill James points to 1975-1980 as the one time in baseball when pitching and hitting was in ideal balance. But balance wasn’t enough to bring fans to the park, or to strike multi-gazillion-dollar TV and licensing deals. There had to be more offense: more hits, more homeruns, more runs scored. So MLB changed the rules again, shrinking the strike zone. For the umpires who wouldn’t use the smaller strike zone, MLB eventually brought in QuesTec. They expanded the Major Leagues, which watered down the pitching talent pool (good hitters are more plentiful than good pitchers). And finally, they took away the only weapon the pitcher had left: the inside part of the plate. For the most part, the pitchers and the hitters did a fine job of policing themselves in regard to the beanball; there was a mutual respect. Few, if any, pitchers purposely tried to maim a hitter with a fastball. Though pitchers such as Bob Gibson and Don Drysdale were known as “headhunters”, in fact their strategy was not to hurt anyone but rather to establish the inside part of the plate as their territory. If a batter was going to crowd the plate or take healthy hacks at inside pitches, he was going to be knocked down — that was a primal signal from pitcher to batter that “I wield the power here, and if you want that inside pitch, you better have the reflexes to get out of the way if I get wild”. It was a key part of the game, and was something of a test of manhood or dominance. When a batter crowded the plate after being knocked down, he was telling the pitcher, “I got the message, and now I’m sending one to you: I’m not scared.” Most of the time, the rest of the at-bat would resume without incident. Frank Robinson, for one, was knocked down dozens of times, and each time got right back up. No yelling at the pitcher, no charging the mound. He’d simply get back on his feet, dust himself off, and slam a line drive somewhere. If a pitcher followed The Code, there would be no brushback the next time Robinson came to the plate — he’d passed the test. Other players reacted differently; for example, if Jackie Robinson was knocked down, he’d lay a bunt down the first base line next time up, and run over the pitcher like a running back when he attempted to field that ball. And of course there was the most obvious and common retaliation: if you hit me, my pitcher is going to hit you. The Cold War strategy was usually enough to keep beanball contests from breaking out. Today, the element of fear is elminated — at least for the hitter. The hitter will not get thrown at, because the rules say the pitcher is ejected if that happens. Further, the hitter has the option to wear an earflap helmet on his head and football gear to protect his front arm, should the ball strike him. The pitcher, on the other hand, is not allowed to wear a helmet, or facemask, or football equipment, and has to worry about getting a line drive between his eyes, or a splinter of maple stuck in his gut. But the batter won’t be ejected for hitting a ball that knocks the pitcher unconscious — it’s assumed he didn’t do it on purpose, despite the fact that nearly every hitter is taught to hit the ball up the middle. Richard “Goose” Gossage says today’s baseball is merely organized batting practice, because the hitters can very comfortably tee off on pitches without fear. El Duque’s unfathomable ejection on Saturday was a prime example. With the support of the MLB Commissioner, any umpire, at any time, can eject any pitcher if he thinks the pitcher was throwing too far inside. 5. The strike zone was about 25% larger. We won’t even get into the quality of the lights for night games back then, the harsher traveling schedules and transportation options, or the lack of modern medicine and trainers to keep guys on the field. And while they surely had greenies, the players in Aaron’s era didn’t have access to performance-enhancers such as steroids or growth hormone — heck, they didn’t even have weight training back then. With all that considered, it’s very hard to have any kind of respect or feeling of awe for a guy like Barry Bonds, who can stand on top of the plate in an armored suit and swing freely and without fear at the offerings of pitchers — many of whom should be in AA. Even with his artificially bloated body, I’d like to see Bonds go up to hit — without the armor and the ear flap — against Bob Gibson, Don Drydale, Stan Williams, Juan Marichal, Jim Perry, Sal Maglie, and others who Aaron had to face. My guess is he’d be lucky to hit half as many homeruns. That’s why I will always see Aaron as the true homerun king — and why baseball hitting records won’t mean nearly as much as they did 25 years ago. Don’t get me wrong — any pitcher who intends to hurt someone with a baseball has no place in the game. By the same token, the ability — and legality — to pitch inside is one of the pitcher’s most valuable weapons. That slight feeling of discomfort in the back of a batter’s mind was the balancing factor of baseball. If things don’t change, the ESPN Game of the Week may one day be slo-pitch softball … or maybe the game of baseball will morph into a team version of Home Run Derby. Things are already getting out of hand. More important than the obscene offensive numbers put up every day is the safety of the pitchers. It’s no coincidence that more pitchers are getting hit by balls going back through the middle — the frequency is a direct result of batters being too comfortable in the batter’s box. Why do you think BP pitchers throw from behind screens? One day, a pitcher is going to get killed, and not one MLB authority is going to realize why. They’ll probably alter the game again, by moving the pitcher’s mound back ten inches. Next Game 12: Win – Mets Sweep!